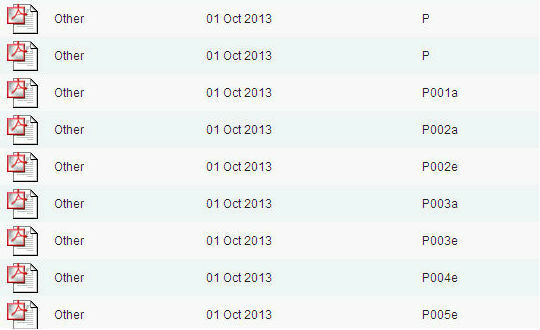 Most of the application data submitted via the Portal is sent directly to the LPA’s planning IT system. Meanwhile, the plans and drawings are retrieved automatically and added to the authority’s document management system. Following validation and registration, all the information is then made available online via the LPA’s planning register. We’ve recently had an increasing number of LPAs contact us about how the naming of supporting attachments could be improved to reduce the amount of time it takes for them to re-index and re-name the attachments they are receiving. This is an example screen shot from an LPA’s document management system following an automatic upload of documents. The third column with the P references are the file names provided by the agent. Note, the file name does not communicate the nature of the file, meaning one of the planning staff needs to open each file and re-name it, leading to a possible delay in validating and considering the application. The re-naming is essential for the consultation process so that statutory consultees, communities and the general public can easily understand what’s been provided and if they want to view each document. When you upload supporting documents on the Portal, the system communicates the document type and the file name to the LPA. The screenshot below shows the attachment screen. Please note that the file name is the name you give your attachment when you create and save it, for example ‘Rear Elevations Plan A3.pdf’. Adhering to these simple, best-practice standards should lead to a quicker registration and validation and help with the automatic display of your application and documents on authority websites. By correctly naming all attachments, when you download your applications from the Portal following submission, the zip file will have a clear naming convention of all of the documents submitted. That’s helpful. An example would be even more useful. Sorry, I meant a screenshot which shows what goes under the field “Attach file” and also under the “Document comments”. ‘Attach file’ picks up the file name of the document – this is communicated to the LPA’s systems. The ‘document comments’ are included in an attachment summary document that the LPA also receives. Increasingly I am finding that validation is being delayed by Local Authorities requesting that their local validation checklist is comlpeted and submitted, in order for the application to be validated and processed. This is normally a tick-list, and more often than not, it is simply a confirmation that the required information has been provided. I submit applications to a number of Local Authorities, so often this will mean that I have to research their local validation requirements before completing the tick-list (stating that the required information has already been provided). When submitting an application via the Portal, you already go through validation on line, and are told that your application is valid; if Local Authorities require additonal information to suit the particular situation then fine, but surely if the supporting information is comprehensive and complete, then this just adds another unnecessary hoop…? I think the Planning Portal could help here by enabling the document description fields to be ‘populated’ with the most commonly types of descriptions used such ‘As existing plans & elevations’, ‘proposed plans & elevations’ etc. I’m sure this used to be possible before various changes over the past three years or so. I have communicated this to the technical team on various occasions but it’s never been resolved. Also why can’t we use an ampersand as it’s a useful shortcut?! “The reason for this is that these symbols are frequently used for specific tasks in an IT environment which can vary, depending on the Operating System and software-type. For example, Microsoft products (such as Windows) use the forward-slash to identify folder levels whereas Mac operating systems use the colon. A simple convention that would help the Applicant would be for The Portal and the LPA to use the applicants “application name” on all replies – so that we get a document that links our reference name to the PP number and then to the LPA number. I can see the point of having a generally accepted file naming system. Presumably that could be in the name of the file itself before the file extension, as suggested. This could make it a bit unwieldy though. Is it also possible to use the Comments box or does this not get transferred to the general public (I have never been clear about that)? On the subject of ampersands and Chris Kendall’s response to Andrew Hirst, this does sound a bit like a “Computer says No” answer! It is true that ampersands are used in a technical way by operating systems, just like the dollar sign. However, I run a Mac and it quite happily accepts an ampersand as part of a file name. Is this just a question of IT people not wanting the hassle of making things easy for the non techie? Forgive me, but I must respond. The entire Portal team dedicates itself to attempting to make the planning process easier for everyone. Some of us have spent more than 10 years on this project out of choice not compunction. We are acutely aware of the Portal’s issues and where things need improvement, however we do not always have the resources to address them. We may not always succeed but is absolutely never for the reason you suggest. I thought the same, surely the “Document Comments” tab allows a more descriptive of the attached file? Anyhow, I don’t quite buy this as an excuse of the processing procedure taking so long, as it would be mandatory for every file to be opened and visually checked against the ever complicated check list and not simply rely on the label! On a technical point the Portal design does not allow us (the user) to view the FULL file name as the text box is too small – – try it and see!! The imported file also picks up the path of the file so it makes the naming even longer. And it makes it difficult to keep track on applications with lots of attachments as the full name can’t be seen – – why not do something like the ‘submit-a-plan’ for the building regs where all the docs are uploaded in one go then individually identified; its not perfect but it is better than the Planning portal. I think you will find that LPAs prefer the ‘Other’ tag because the higher proportion of applicants fail to name their documents correctly when given the choice themselves. It is therefore more efficient, effective and safer to have them named ‘other’ and checked (as they are anyway) at the LPA end and renamed as appropriate. The fallout from incorrectly named documents is great, ranging from customer confusion to claims of lieing, mal-administration and incompetence. So, the best option all round, is to have them come to LPAs as ‘other’ and administer them from there. Chris. HI there. A problem I have experienced with submitting planning apps on line is that the drop down menu bar for ‘add documents’ does not always work. A lot of the time it will just come up with ‘location plan’ or ‘site plan or other’. Only occasionally does the full list of other alternatives appear. I try and use the document comment bar as the opportunity to actually describe what it is I am submitting. have you spoken to our support team about this issue? The more limited set of alternatives only appears in the “Mandatory documentation” part of the upload page. The full set of alternatives appears when adding “Local level requirements and additional documentation” at the bottom of the page..
Whats wrong with loading a document list. I have a drawing list on page 1 of a multipage pdf and this is normally the only uploaded document apart from the Design and Access Statement and form. On another point, when agents/applicants send an updated version of their application via the portal, could it possible that only the relevant documents/plans that have been amended could be attached rather than everything again, as this can sometimes be quite hard to see what has changed, especially if it is a major application. Whilst a naming convention sounds like a good idea at first, after a couple of seconds thought I realised that we should have to create new file names for our drawings for submission. I think every architect in the world uses a job/drawing number naming system for drawing files and probably other documents. Once you change that for a specific function (a planning application) there is massive scope for making errors if any of the submitted drawings are revised/updated. We have always worked on the principle that the name of the printed output exactly matches the computer filename. That way if you have the paper copy you can find the computer version and vice versa. The suggestion made above of using the description field in the uploads section to identify what a drawing shows seems far more sensible. Moreover, if we were presented with a drop-down list of descriptions together with a format for creating unique descriptors, the problem would be solved and us architects could keep our tried and trusted drawing and file names intact. Dan makes a valid point and his proposal is blessed with simplicity and common sense – ingredients for a system that will work. The established method of identifying drawings is tried and tested and should be accepted as the basis for electronic adaption. Drawings take many forms, with a variety of permutations and combinations of sections, elevations and plans of many types: any attempt to cover all eventualities with drop-down menus is doomed to failure. Please let us stick to our numerical labels. The description field is the ideal place to categorise the content (after all what else is it for?) and as already said, the document has to be opened and checked to see that it matches its title. A cynical view might be that a well tried and tested system of drawing identification, fully accepted and understood in the construction industry is now under pressure from a system only recently brought into being to assist validation by some who may not fully appreciate the subtle difference between a ‘plan’ and an ‘elevation’. Sorry if this sounds grumpy but I’ve sent it while waiting for the main Portal site to open, to allow me to make a new application! Any tips that make the validation process quicker are to be welcomed however another common problem that slows the process is when plans are submitted with the wrong orientation so that the planning authority has to rotate the plans before publishing them online. Agree 100% with the comment above from Fran Tanner. It sounds like a small (maybe petty) thing to complain about but it isn’t just a matter of clicking document and then rotate. I think the portal puts through plans through Adobe Live Cycle (or similar) which means a copy needs to be saved somewhere else, moved back to the original location and then rotated. Not a huge job but on large applications the time soon mounts up. Regarding file names I’d agree with the comment by Oxfordshire LPA. Renaming by the LPA also means file names can be kept as similar as possible rather than having a different format for each applicant/agent. Well that may explain why some web-based planning registers are next to useless as there has been no attempt to ‘re-index and re-name the attachments’ and applications are accompanied by dozens of anonymous documents. Although it does not explain why other LPAs are capable of providing well-organised lists of supporting documents. I suspect it highlights the difference between those that are interested in serving users of the planning system and others that are simply box-ticking bureaucrats. « What are your essential online planning application tools?